Hi there. This is part 1 of setting up your DIY settings. In this video, I’ll be showing you how to set up the payment process. There’s two ways you can do this: with Recurly or without Recurly. Now before we get into the rest of the video, please make sure you’ve already seen our video on DIY, which is the 10th video in the White Label Tutorial series. It’ll go over the basics of the DIY settings, including how to create plan configurations which is a crucial part to this video. Let’s move onto Recurly. First off — what is it? Recurly is a subscription payment service. This means that it will automatically prompt the customer’s credit card to pay a set amount every month. Along with these recurring fees, you can charge additional fees for design, marketing, and website services. Now let’s get to actually setting up your account with and without Recurly. 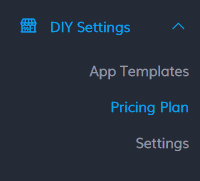 Head to the DIY Settings > Pricing Plan section of your admin control panel. To set up DIY without Recurly, you will need to decide on two things. Whether you want to use our Pricing Page or your own. To learn more about this and get some advice on how to price your services, please see our video on it here. What other payment portal you’d like to use in conjunction with our platform. When you created the plan configurations, you were asked to include a purchase URL. This is where your customer will be directed to in order to pay for their app. In lieu of Recurly, you will need to insert a purchase URL. This could lead to PayPal or any other online payment service that you’d like to use. In your other payment portal, you will then have to use the webhook URL and/or the redirect URL here to then tell it to redirect your customer back to the app after they successfully make the payment. Most if not all payment portals should have this functionality. Setting up the payment process without Recurly can be great if your business already has a payment process set up and you’d like your white label platform to integrate with it. However, it doesn’t have the same smooth flow as what it’d be like if you used Recurly instead. We here at Buildfire use Recurly ourselves because of its reliability and easy-to-use design [seamless checkout service]. Setting it up takes a few more steps, but in some cases it’s really quite worth it. To create a Recurly account, go to recurly.com and click “Try It Free”. Don’t worry about payment, yet. You’ll have access to an unlimited free trial until you go live. Click Create Plan and start creating your plans in accordance to the ones you’ve already created (if you haven’t created them yet, you can skip this part). At the end, feel free to go ahead and create the rest of your plans, but if not go to your dashboard. This next page will help you get started with Recurly in 4 Steps. The first is to add a payment gateway. Pick from their list of possible payment gateways. If you already have one like PayPal, go ahead and integrate it here. The second is to integrate and test. Read their implementation guide on how to implement Recurly in sandbox mode. When you’re ready, you can move onto the third step which is to sign up for Recurly’s subscription service. Do this whenever you’re ready to start paying. Then afterwards, you’ll be able to go live and start using recurly in your white label account. To connect your Recurly account, you can find the API keys by logging in, and selecting the ‘Developer’s tab on the bottom left hand side of the page. There, you will find the API key information. Copy these keys select “Yes” for the question about Recurly, then paste the keys here. You subdomain can be found under Configuration > Site Settings. Copy and paste in the subdomain here. Now for each of these Pricing Plans that you created, all you have to do is click Edit and select the corresponding Recurly plan from the drop down menu here. No need to do anything else — you’re all set with setting up your account with Recurly! Now that you’ve learned about Recurly, check out Part 2 of the DIY videos: Setting Up Your Pricing Page.